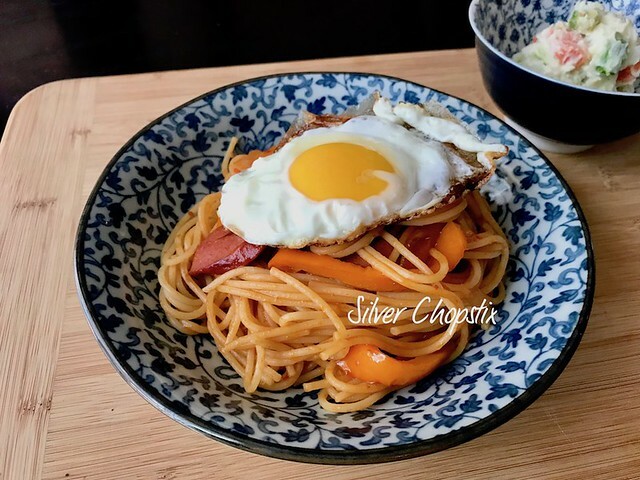 Spaghetti Napolitan is another popular Yoshuku (western style Japanese cuisine) dish. It was invented by Shigetada Irie, the head chef of Hotel New Grand in Yokohama after World War II. He got this idea from the spaghetti with ketchup that was part of US military rations. He did not use ketchup in his original recipe, but instead used tomato puree. This became so popular and was recreated by other restaurants in Japan. Since tomato puree and fresh tomatoes were expensive then, ketchup was used in its place. 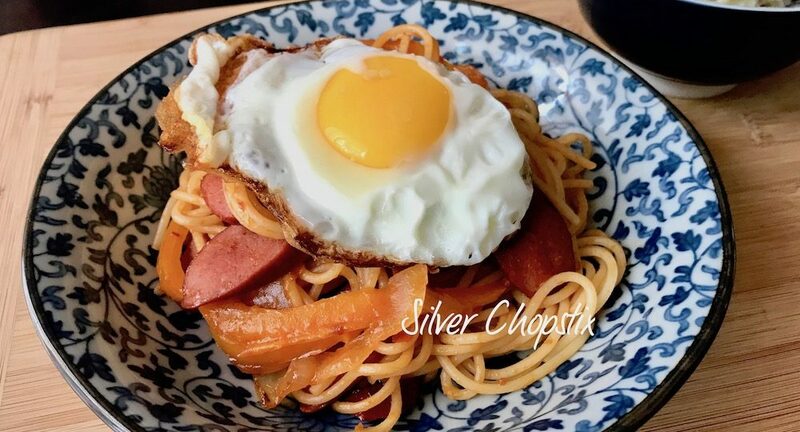 The dish that I made was adapted from Rika’s Tokyo cuisine’s recipe for Napolitan pasta. 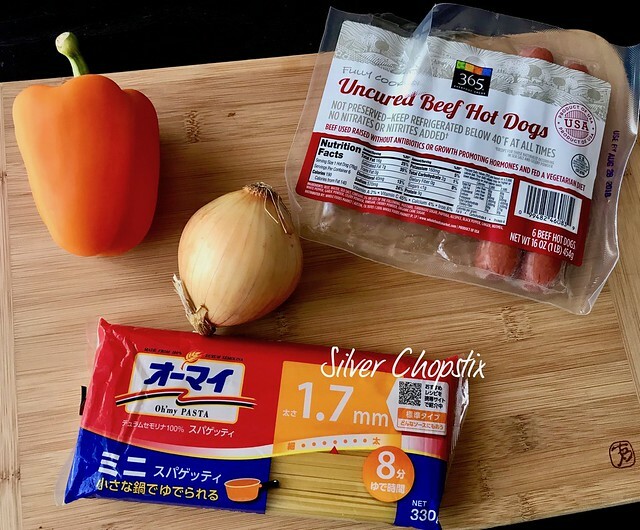 To make, cook spaghetti according to package directions (I used 330g pasta). Set aside 1/2- 3/4 cup pasta water. Thinly slice I medium sized onion, as well as one bell pepper. Green bell peppers are traditionally used for this recipe but I used yellow bell pepper instead since this is what I have on hand. Then cut 2 hotdogs diagonally (I used 365 brand uncured hotdogs). I recommend using the Japanese kurobuta sausage if you can get a hold of it. Heat a pan and add 2 Tablespoon butter. Add the onions and bell pepper and cook until softened. Add the hotdogs and continue cooking until a bit brown on the edges. Add 4 Tablespoon ketchup, 1 tsp. toban djan (chili bean paste), 1 tsp. sugar, salt and pepper to taste. Stir to combine. Add your spaghetti and toss everything until pasta is coated with the sauce. You can add some pasta water if the sauce is a bit dry. 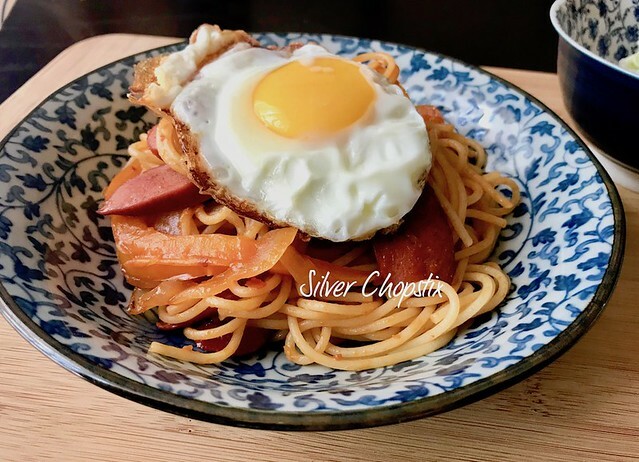 Place some pasta on a dish and top with a sunny side egg.